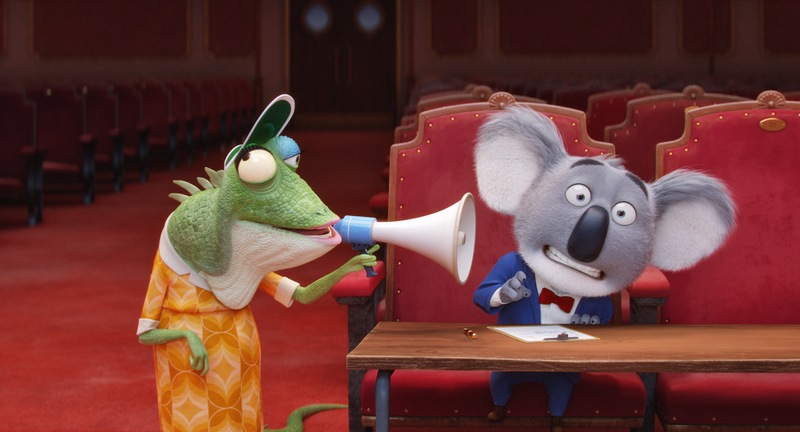 Film review – Sing (Garth Jennings, 2017) | Cinema, etc. Good, harmless fun is how I’d describe the latest release from Illumination Entertainment. We don’t learn much about ourselves and we don’t get any kind of social commentary. The characters don’t stand out in terms of being inspirational, nor do they have the look of characters that will become favourites in years to come. But that doesn’t mean it’s a bad film and it doesn’t mean that the children it is aimed at won’t have a great couple of hours at the cinema if they see it. The story follows Buster Moon (Matthew McConaughey), a koala who owns a theatre that is running out of money. As a last ditch effort, he plots to hold a singing competition, but his assistant accidentally advertises a $100,000 prize fund instead of $1,000. 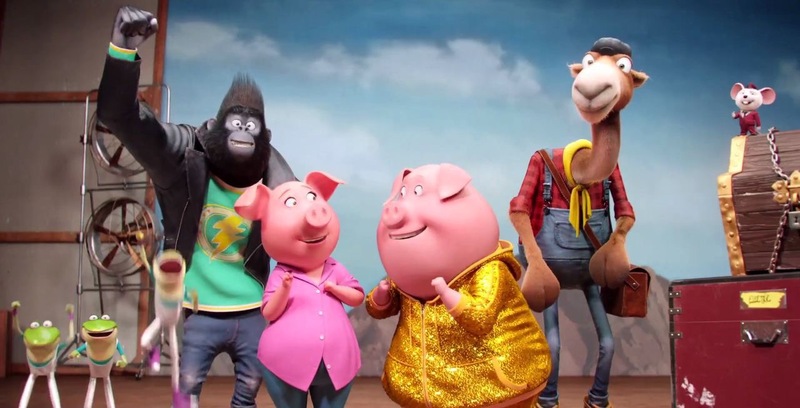 This sparks the interest of a range of hopefuls that make up our lead cast: shady mouse Mike (Seth MacFarlane) who specialises in Sinatra-style crooning; shy elephant Meena (Tori Kelly) who suffers from stage-fright and nerves; porcupine Ash (Scarlett Johansson), a goth-teen who is hampered by the fact she is performing in the shadow of her self-centred boyfriend and needs to shine herself; cockney gorilla Johnny (Taron Egerton), stuck in a family of mobster gorillas but wanting to follow his own dreams; and pig Rosita (Reese Witherspoon), a housewife who is so busy looking after 25 children and a hardworking husband that she has no time to pursue her dream of singing on stage. There’s also a group of cute, small Japanese dogs who evoke the worst of J-Pop culture to hilarious effect. The universe these characters live in is a world of animals that looks like Zootropolis’s lazy and less charismatic younger brother. It’s a shame because if this had been released three years ago, the plethora of ideas would have brought the opening scenes to life, but in the wake of Disney’s triumphant film that is now almost a year old, it just doesn’t quite feel like it’s hitting the mark. It begs the question of which was storyboarded first and was there anyone involved in both projects that might have leaked information one way or the other. One of the biggest flaws is the casting of McConaughey in the lead role. The character calls for a certain tone of charisma that simply isn’t delivered. This is surprising, because he has developed into a fantastic actor over the last decade, but it does highlight that voice-over acting isn’t something you can simply turn up and expect to be good at. There are some hilarious moments in the film, which is what we’re looking for. One highlight comes from mouse Mike, who at one point sings Sinatra’s My Way – brilliantly – whilst a helicopter circles above, causing him to lift off the ground and then circle over the audience in a supremely stylish landing. It’s great setpiece, even if the build up is a tad protracted. But that is what the film is about – big set pieces that will be fondly remembered, even if the overarching plot doesn’t deliver any great payoffs. A solid and enjoyable effort that is quickly slipping from my memory.